A Model D house is a very low-energy contemporary home. Constructed from good quality timber they represent spectacularly good value, and are a hard-to-beat model for genuinely affordable housing stock in the countryside. Efficiency, durability and minimal energy consumption were fundamental considerations along with life-cycle cost in defining our “fabric first” approach. This makes Model D homes extremely efficient due to their use of durable materials, combined with our “wrap round” approach to air-tightness and integrated use of exceptional insulation levels. The triple-glazed timber frame windows are finished with aluminium externally to remove the need for painting and the structural walls are clad with extremely durable Siberian larch. This is further enhanced by an optional deck constructed from ‘Thermowood’ heat treated pine and eaves rain screening from Siberian larch. Neither requires any protective coating, and will last for decades. All fixings are stainless steel. The underside of the roof overhangs are also finished with Siberian larch linings. Roof tiles, slates, corrugated iron or metal standing seam are the main roof finish options, usually with galvanised or colour coated steel guttering, and all are well proven for durability and minimal maintenance. Wide roof overhangs are generally regarded as good practice, especially with timber clad buildings, as they protect the walls where they are most exposed. Those on Model D Homes are generous, and combine with and support the eaves rain screens to provide additional protection. There are a number of good reasons for having these screens, not least that they provide a very traditional building profile. The rain screens and decking construction is structurally separate from the houses, and can be removed or replaced independently. Other benefits are providing an intermediate zone for storage and drying, and, of course, a great opportunity for trellis type planting. They enhance privacy and sun shading from overheating, but are normally cut out at the main windows so as not to obscure views. The design is contemporary and seeks to have minimal landscape impact, which is hugely assisted by the rain screening and its natural timber finish along with that of the walls. 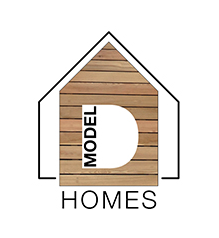 Although primarily aimed at the rural housing market, Model D houses can be built in urban and suburban locations. Despite being timber clad, they can, subject to opening sizes, go on small plots and meet fire regulations. The floor areas of all our standard house layouts are modest, but internally they impart a great sense of light and space due to their informed and innovative design. Provision is made for home working, and being “future capable” is a core consideration. Another basic concept is that these are whole life-homes that people will want to cherish, and not just see as another step on the property ladder. Many of the homes we supply are amended standard designs, often extended or with additional glazing to suit individual sites. The Model D construction method we have developed can also be applied to bespoke layouts. Overheads add to the cost of delivering a product or service, and the philosophy behind Model D Homes is to minimise these by standardisation, and to focus on all aspects of product development to reduce them as far as is possible. This can be enormously beneficial in that it allows far more value to be contained in our house kits within their overall specification and performance in use. The whole concept is inspired by car design and production (with particular reference to Henry Ford!). He revolutionised that industry, and we want to apply some of the same principles to providing affordable rural homes. The cost of building a house sold by a developer is usually about a third of the purchase price of a new housing estate home, and we want to bypass that. Providing rural housing with minimal environmental impact is the main purpose of Model D Homes, and we seek to make a major contribution towards affordable living and the quality of life of those wishing to dwell in the countryside. Almost all new houses require some renewable energy input, and the most commonly used in our houses is photovoltaic (solar electricity generating, pv for short), although solar thermal (water heating panels with a coil in the hot water cylinder) is still sometimes used. Air to air or air to water heat pumps are another alternative, as is geothermal (heating water through a bore hole or buried grid of pipes). Heated water can be used as a thermal store, and this is still the most commonly used method for storing energy, although the future points towards domestic battery storage allowing minimal dependence on a mains electricity supply. All Model D homes have a ground floor bathroom or shower-room (D3 only), plus living accommodation and a bedroom on that level (except the D2), so along with access ramps, flush thresholds, circulation space and electrical fittings locations (all as required by the building regulations), they can provide single storey wheelchair user occupancy. Independent living and accessible accommodation quality are a high priority. The stairs are also designed to take chair lifts. Due to their high levels of insulation and air-tightness, Model D Homes are extremely energy efficient and an intermittently used small wood burning stove should be capable of heating the entire house. Care needs to be taken during construction not to compromise the airtightness. Any service piercings of the external shell need to be monitored and proper sealing undertaken.